Ioannina Car Station - ΖΑΡΙΦΟΠΟΥΛΟΣ Α.Ε. Installation of Fire Alarm, Fire Suppression, Gas Detection, Closed Circuit Television (CCTV) and electromechanical Control (BMS) Systems, in the underground car station in the central square of Ioannina. Automotive Station of Ioannina is located in the commercial heart of the city of Ioannina, in the central Pyrrhus square, with roofed and guarded areas. It has 530 parking spaces spread over three levels, just below the square. At the station are installed Fire Alarm, Fire Suppression, Gas Detection, Closed Circuit Television (CCTV), and electromechanical Control (BMS) Systems, which have been supplied and installed by Zarifopoulos SA. The installed fire detection system by Kentec Electronics covers all areas of the plant with an appropriate number of addressable detectors, call points and sirens. Mechanical areas are protected by CO2 extinguishing cylinder arrays with automatic local extinguishing panels by the English house Kentec Electronics. Gas Detection System by German company ADOS plays an important role and consists of 42 carbon monoxide sensors and detectors, placed at all three levels of the station, divided into six different groups, with autonomous functions per group. The electromechanical building installations are supported and controlled by an extensive Control system (BMS) by Honeywell. 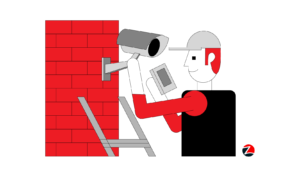 The CCTV system consists of antiballistic cameras by Vista and Merit Lilin, placed on selected parts of the building and an appropriate number of digital recorders (DVR), by Honeywell. Timeline: Installation 60 days, project completed in the ending of 2009. Unique Benefits: Warranty performance materials and high expandability of systems. Safety of operations and facilities, Responsibility and Accountability, Innovation, Cooperation and Solidarity, Honesty and Transparency, Flexible solutions, Belief in defined rules, Commitment to Efficiency and smart Adaptation. Development with ethics and values in partnership with our People, the Environment and Society, aimed at creating value for our Customers, Partners, Employees and Shareholders, with the ultimate goal to expand and establish our Leading position in the security industry as the dominant Greek Group of Security & Control Services in SE Europe. Our mission is to offer superior Products and Services in the field of Security, providing Safety and Protection to the Greek society, improving our quality of life. Safety is the first priority social good and our goal is to offer it to everyone. It is a difficult task but we manage it very seriously. We study your needs, listen to our customers and offer the best solutions in terms of performance and cost with qualified staff and in record time. Official website of the Greek market leader in the Electronic Security Systems in Greece.